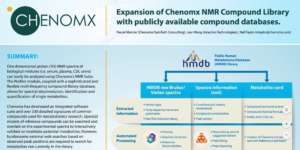 Through an agreement with the HMDB group at the University of Alberta, Chenomx now offers compound libraries based on data within the HMDB library. We are pleased to credit the Wishart Group at the University of Alberta for the access to the data within the library. 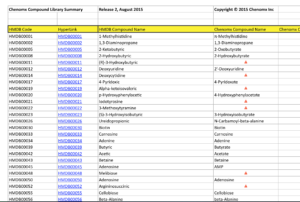 Download this library and get access to about 600 metabolite signatures. These signatures are based on data collected and created by the HMDB group and include the detail available to Chenomx from that HMDB library. We suggest that the concentration data be used for identification and as relative concentrations; when the HMDB spectral entries were collected they did not have the Chenomx library needs in mind. In order to download these libraries using the links below you will need to request a username and password. Use our contact form and fill in your details. A Chenomx representative will respond to you with the credentials you will require to download the HMDB compound packs. Please request access to receive the username and password necessary to download these compound packs. You will need Chenomx NMR Suite 8.1 or later to qualify for access to this library (no additional charges are required). These compound packs can be installed quite easily by using the Library -> Add Compounds... wizard and choosing the Import Compounds from External Sources radio button. Once it is downloaded, extract the contents of the zip file to your Chenomx Reference Card location. This is typically located in your user profile as a folder called "Chenomx Reference Cards". If you are unsure of where this is on your system, open Library Manager's Preferences and you will see the location. You may need to create this folder if you have never used it before. The software should then be restarted to use the new reference cards.